Well, it's Monday all ready! I can't believe how fast the holiday weekend flew by! This also means it's time for another addition of Not Me Monday hosted by MckMama. 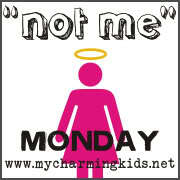 Go check out her site and see who else is confessing all their "not mes"! 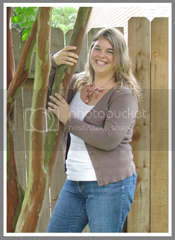 This week I definitely did NOT have some more "pregnancy follies" as Jason calls them. He did NOT suggest that we write a song about all the "stupid" things I have done while pregnant. For instance, I did NOT put a large Yankee Candle on a candle burner and forget to take off the lid! No way! Luckily Jason saw the candle burning and took the lid off before it exploded. Whoops! It was also definitely NOT me who, within five minutes, broke a glass while unloading the dishwasher because I missed the cupboard and then banged my head on said cupboard door. Also, it was NOT me who was up at the crack of dawn on Wednesday morning making mashed potatoes... and during that mashed potato frenzy it was NOT me who burned her belly while pouring boiling hot water into the sink. It really hurt! This pregnancy is NOT turning my mind to mush and causing me to be rather clumsy and forgetful! And it was NOT me who got up early to go Black Friday shopping and scored some great deals, and then came home and decorated the WHOLE house and managed to wrap presents and put them under the tree. I'm NOT a Christmas nut! It was also NOT me who lost her first Fantasy Football game in five weeks! I am NOT totally bummed about this! And finally it is NOT me who is all ready 30 weeks pregnant as of today! Where did the time go? I had a baby over a year ago and my mind is still mush.. If it makes you feel better, I went out on Thanksgiving and bought a tree and put two trees up..I love me some Christmas..
Haven't started the shopping yet though. Oh that pregnancy brain...I looked for my sunglasses for a good 30 minutes once late in my pregnancy only to find them perched on top of my head. Wishing you a smooth final 10 weeks. Wow, I remember those crazy "placenta brain" pregnant days--times five! May you pass the next ten or so weeks peacefully and joyfully!